Does your brand Pin? Social Media Marketing Plans in 2019 need a solid plan in place for how to use Pinterest as part of the overall marketing strategy to avoid missing out on key opportunities to reach potential new customers. 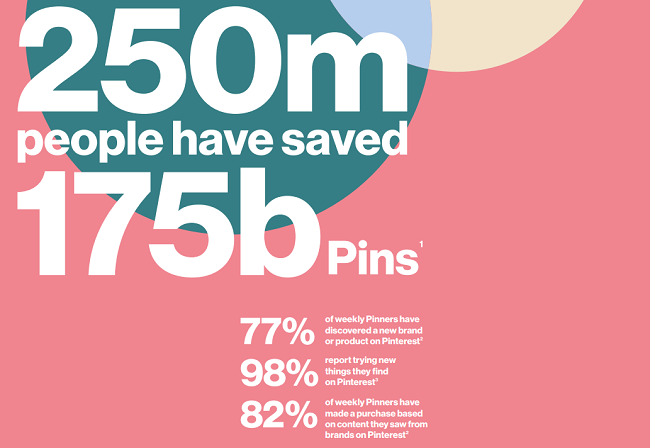 Pinterest the web-based pin board and bookmarking tool continues to show strong global growth with 250 million people now using the platform every month – an increase of almost 40% year on year. Although specific UK usage stats are unavailable, UK users are estimated to be around 40% making it an important social platform with deep penetration in valuable demographics. Pinterest has also released some impressive usage and purchase stats – revealing that 90% of weekly Pinners use the platform to make purchase decisions, with 72% saying the channel inspires them to shop when they actually aren’t looking for anything. People use Pinterest for completely different reasons than they use other social platforms. Pinterest is a platform where people look for inspiration, including specifically seeking out ideas about new products to buy. That means they are excited to see posts from brands in their feeds. 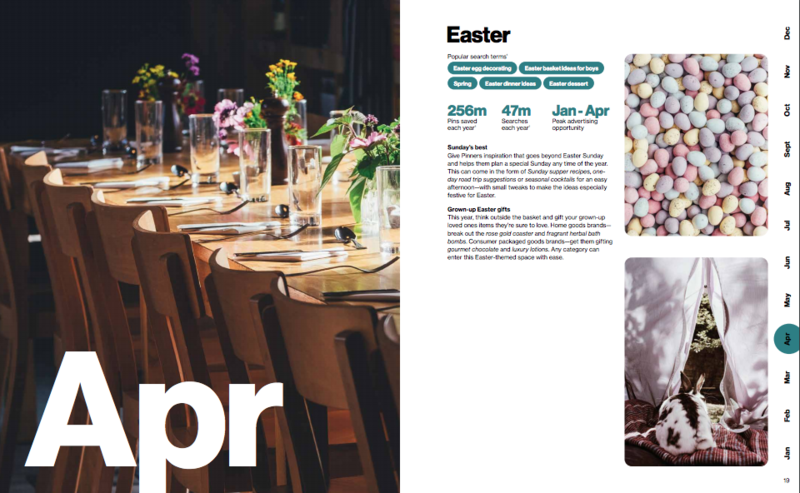 To help support annual marketing planning Pinterest has released a new 'Seasonal Insights' guide to help brands and pinners plan out their 2019 content and maximise key opportunities. The guide includes a range of stats and data points, including the latest platform usage trends. 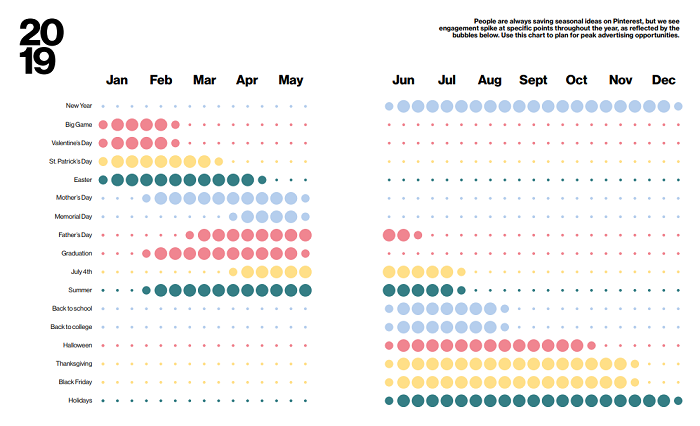 But the main focus is the seasonal activity guide - to start with, Pinterest has provided a planning chart which highlights when on-platform interest starts to ramp up around specific events throughout the year. The chart can help in planning when you should boost your advertising activity around each event, while Pinterest has also expanded on each in the latter sections of the guide, providing event-specific insight, including stats on saved Pins and search activity. 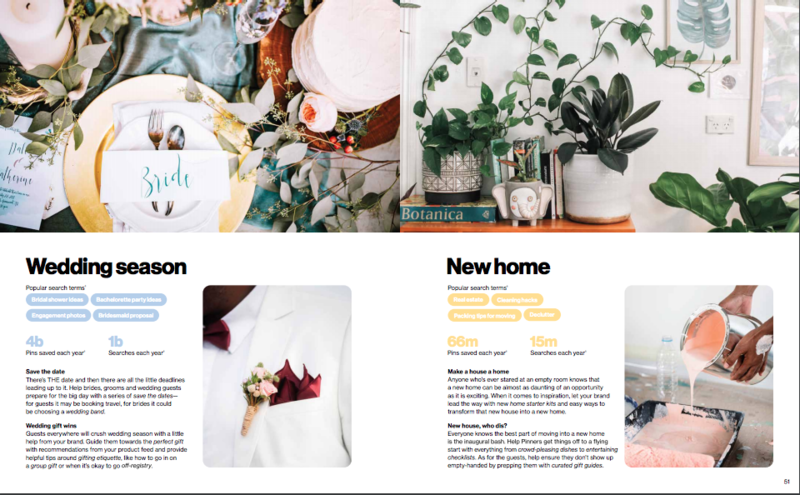 In addition to this, the guide also includes notes on 'Life Moments' to help advertisers tap into even more opportunities on the platform. If you're looking to get more out of Pinterest in 2019 or introduce it into your brands social media marketing approach, this is an excellent read - not only will it open your eyes to the various opportunities, but it provides specific notes on how to tap into each and make the most of your Pin efforts. Pinterest is also improving its ad offerings and visual search tools - most recently, for example, Pinterest added Carousel ads, providing additional ways to reach users in a shopping mindset. Pinterest isn't in the same category as other social platforms, as it's more focused on product discovery, and that's how it is best approached in order to tap into the various Pin opportunities. If you haven't considered Pinterest before, it's definitely worth another look. Can IF Agency help your brand and business grow through using Pinterest to best effect this year? Get in touch here for an initial chat about how we can help you. 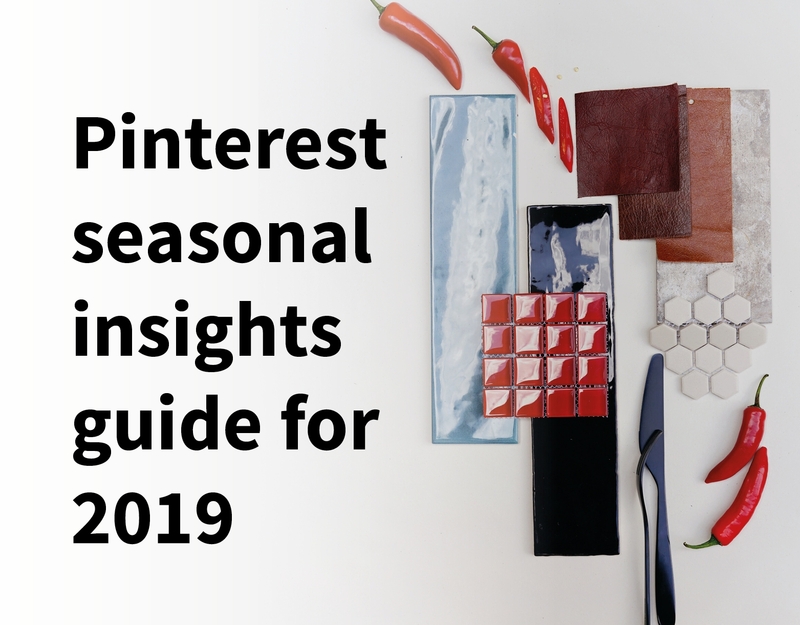 You can download Pinterest's '2019 Seasonal Insights' guide here.